Huge Monogrammed Beach Bags Only $19.49! You are here: Home / Great Deals / Huge Monogrammed Beach Bags Only $19.49! 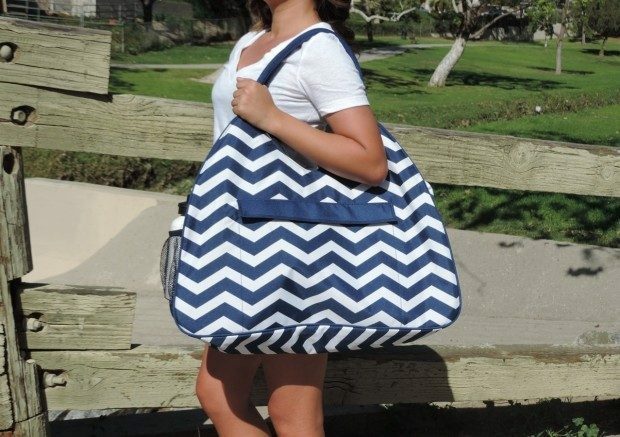 This fabulous beach bag is available in 7 colors! These Huge Monogrammed Beach Bags are Only $19.49 and can be monogrammed in 2 different styles! Measures 22″ L x 8″ W x 12″ H.
Crafted from 600D Polyester, extremely easy to wipe clean. Contains an inside Zipper Pouch (7.5″ x 5.5″) to keep your wallet, cell phone, make up in place. Outside Zipper Pocket; measures 12.5″ x 10.5″, perfection. Top has a Zipper Closure to keep all your goodies safely inside. Side Mesh Pocket – to Keep Drinks, Sunblock, Baby Bottles Handy.